The Christian Democratic Union of Germany (Christlich-Demokratische Union Deutschlands, CDU) is a globalist and liberal-conservative establishment political party in Germany. It is a politically-moderate party, and frequently enters coalition agreement with the left-of-center Social Democrats. The CDU is always in partnership with the Christian Social Union, its more conservative sister party in Bavaria – the CDU does not field candidates in Bavaria and, in turn, the CSU does not field candidates outside it. When adding the mandates of both the CDU and CSU, who caucus together at the national level, they form the largest parliamentary group at the national level. Both parties are also in control of a majority of governments at the state level, with 11 out of 16 heads of state governments hailing from one of them. In 2013 the CDU won again the majority with 41.5 percent, but its ally the Free Democratic Party left the parliament because they had not enough votes. The Christian Democratic Union has created a coalition with the left-center SPD, who got 25.7 percent of the vote. The CDU declined by 8% in the 2017 election, losing much of its votes to the conservative and Euroskeptic Alternative for Germany. The party was founded in post-war Germany by centrist and conservative Christian politicians who were former members of the Centre Party and wanted to overcome the divisions among democratic Christians politicians in pre-war Germany, which was perceived as one of the reasons of the deadlock in politics during the Weimar Republic. Before 1934 Germany was about 1/3 Catholic. West Germany was now about evenly split between Catholics and Protestants. The CDU (and its sister party the CSU in Bavaria) regularly won about 60% of the Catholic vote, and 35-40% of the Protestants. To control a majority in the Bundestag (national parliament) it formed coalitions usually with the small Free Democrats (FDP), a conservative/libertarian party favored by big business and professionals. Leading figures in the post-war era were Konrad Adenauer and Ludwig Erhard. Adenauer became the first Chancellor of West Germany, and who was seeking firm military and economic integration of West Germany with western Europe and the US. Ludwig Erhard was the first Minister of Economy, renowned for his advocacy and implementation of social market economy, and is considered the father of the German Wirtschaftswunder, the economic boom in the 50s and 60s. These two political concepts, social market economy, and integration in the West, have become the two main ideological pillars of the Christian Democratic Union. In the German Democratic Republic the CDUD (Christlich-Demokratische Union Deutschlands engl: Christian Democratic Union of Germany) should subordinate the Socialist Unity Party. Only in the first free elections of 1990, the CDUD merged an election alliance called "Alliance for Germany" and could win the election. On October 1 and 2 of 1990, the CDUD merged with the CDU to one party. It should be noted that under Merkel's leadership, the party has moved more to the political center in recent years. Voters in Germany haven't approved of this new course: although the CDU managed to emerge as the strongest party in both the 2005 and 2009 elections, winning Merkel the chancellorship, their share of the vote was only 35,2% and 33,8%, respectively. When running more to the right, as has happened under the leadership of Bavarians Franz Josef Strauss in 1980 or Edmund Stoiber in 2002, the party performed much stronger: in 1980, Strauss almost managed to win an absolute majority; in 2002, Stoiber obtained the best results the CDU has enjoyed in the current five-party-environment. Both candidates only missed the chancellorship because the left-wing social democrats could assemble majority coalitions with smaller centrist parties. 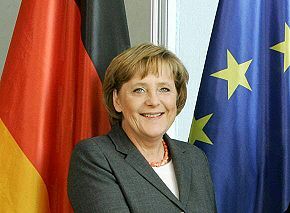 The September 2009 elections were a major win for the conservative forces led by CDU Chancellor Angela Merkel, breaking a stalemate and opening the way for more conservative economic policies. Previously since an indecisive election in 2005, the Christian Democrats (CDU) (on the center-right) formed a "grand coalition" with the Social Democrats (SPD) (on the center-left). Merkel and her CDU formed a coalition with the libertarian, pro-business Free Democrats (FDP) to 2013. Left in the cold was the SPD, the Greens, and the ex-Communists who remain strong in the former East Germany under the name "The Left". Merkel moved forward on tax cuts, reform of the tax code, reduction of bureaucracy and a possible extension of the time that nuclear power plants can continue to operate. In 2013 the Free Democratic Party (FDP) left the parliament. So the CDU created a "grand coalition" with the SPD again. The party has regional party groups, the federal group (Bundesverband, there is only one), the state group(s) (Landesverbände, singular: Landesverband), the county group(s) (Kreisverbände, singular: Kreisverband) and the local group(s) (Ortsverbände, singular: Ortsverband). All local groups in a county (Kreis or Landkreis) are part of the county group, all county groups in a German (federal) state (Land or Bundesland) are part of the state group and all state groups form the federal group. The present chairwoman (of the federal party group) is Annegret Kramp-Karrenbauer, vice-chairman are Volker Bouffier (Minister-President of the federal state of Hesse), Ursula von der Leyen (Federal Minister of Labour and Social Affairs), Julia Klöckner (chairman of the CDU of the federal state of Rhineland-Palatinate), Armin Laschet (chairman of the CDU of the federal state of North Rhine-Westphalia) and Thomas Strobl (chairman of the CDU of the federal state of Baden-Württemberg). The federal party group holds a think tank called Konrad-Adenauer-Stiftung (Konrad Adenauer Foundation), named after the first chancellor of post-World War II Germany Konrad Adenauer. The state party groups have similar foundations. There's a special relationship between the CDU and the Christian Social Union of Bavaria (CSU). The CSU is legally a party of its own but cooperates closely with the CDU. The CSU only acts in the state of Bavaria and the CDU in the other states. The CSU is independent and has its own political structure and party platform, which differs in some positions from the CDU's one so that the CSU can be considered more conservative. The most prominent politician of the CSU was Franz-Josef Strauss. The CDU has special organizations for demographic groups (youth, women, older/retired citizens, etc.). The CDU has been compared with the Republican Party in the United States. It supports a social market economy, used to oppose "equality" of homosexual pairs with traditional families (but now has given into the homosexual agenda) and is stated to support the USA and Israel. But it has also liberal views. For example, it opposes the death penalty, which is outlawed by the current German constitution. It also supports mass immigration and destructive refugee policies, the socialist and globalist European Union and open borders, and has apparently lost its Christian roots.